On April 3, 2011, NASA released this image of Jordan's eerie Valley of the Moon taken from the Advanced Land Imager (ALI) on NASA's Earth Observing-1 (EO-1) satellite, which captured this natural-color image on July 27, 2001. Mountains of granite and sandstone — some reaching heights of about 5,600 feet (1,700 meters) above sea level with near-vertical slopes- loom above valleys filled with red sand. Some of the mountains. The lunar landscape, called the Wadi Rum, was declared a protected area in 1998. According to NASA, nomadic peoples have lived in the rugged region for thousands of years. Lawrence of Arabia, who fought in the Arab Revolt of 1917–1918, made frequent references to Wadi Rum in his book "The Seven Pillars of Wisdom," according to a NASA statement. The Advanced Land Imager (ALI) on NASA's Earth Observing-1 (EO-1) satellite captured this natural-color image on July 27, 2001. Image credit NASA. 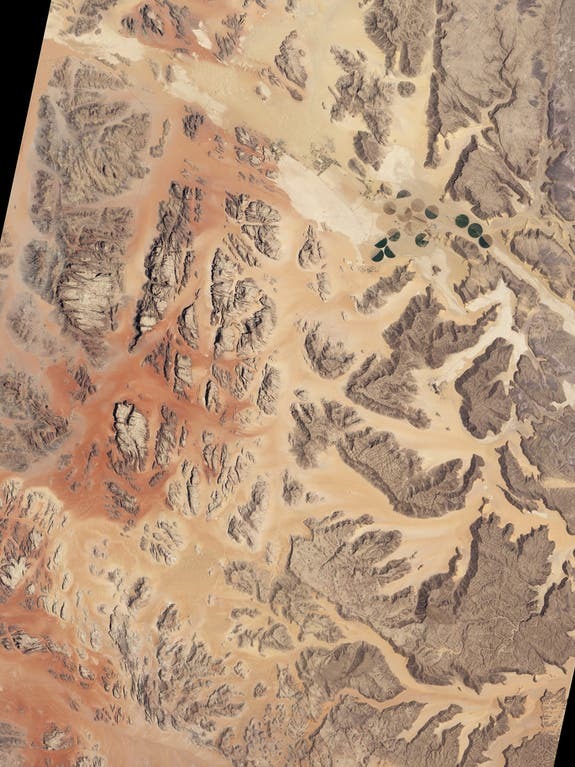 The scene includes part of Wadi Rum and an adjacent area to the east. NASA released the photo on April 3. The Daily Galaxy via NASA and OurAmazingPlanet.